The results of a survey conducted in April 2012 by Adobe. It was a shocking report. The investigation comprises the results of surveying 5000 people in the US, UK, Germany, France, and Japan. Outside of Japan, Japan was rated the most creative, taking the top spot with 36% (the US was in second place with 26%). Pop culture, fashion, dining, in each of these categories, Japan pulled out ahead. In terms of things like finance, IT, and Hollywood, America has been out ahead of the world, displaying its creative power in the world of business, but I believe if we see expressive culture as not a matter of a small segment of creators, but in terms of the ability of every citizen to create, that Japan clearly surpasses the US in this matter. Among the cities rated, 30% picked Tokyo for the top spot (New York 12%, Paris 15%). Tokyo is made up of many communities such as Ginza, Shibuya, and Akihabara, each illuminated with their own vibrant color. No matter where you go in the city, public toilets meeting the highest standards in the world have been prepared for use, in the spirit of hospitality. You can dine on top quality cuisine from around the world. And I doubt there there’s another city with quite so many Italian and French flags flying. And your wallet will be safe, even if you lie down for a nap on a train platform bench. It’s no wonder that people are paying attention to the creativity that is radiating from an environment like this. There were, however, two worrying points in the report. The first is that Japan’s self-assessment was low. Compared to the ratings of other countries, Japan alone did not think that Japan was a creative country. In fact, the rate of self-evaluations as creative was in the lowest bracket. 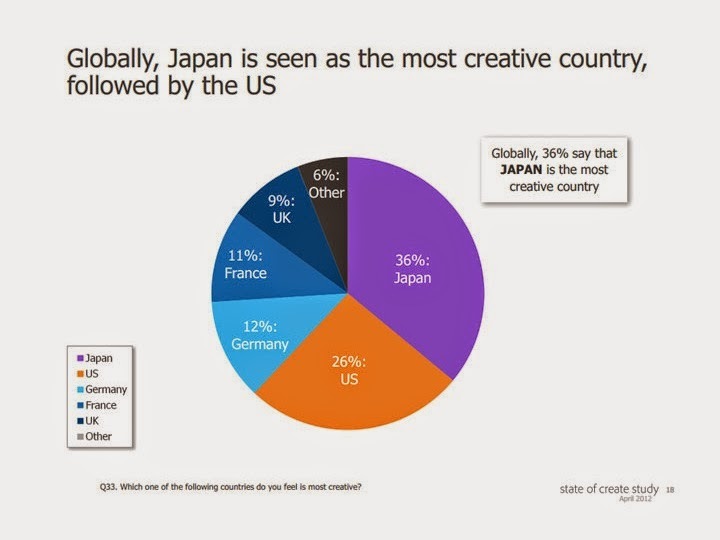 Although 52% of Americans thought their own country was creative, only 19% of Japanese did. It is difficult to evaluate yourself, and difficult to become your own driving energy. The self-generated spark needed to utilize the power of pop culture is pretty hard to draw forth. Even in this most recent survey, we see the tendency towards an inability to make fair evaluations of the things which are your own. The other bit of bad news is the result that states “Japan ranked last among those who believed that creative power would be the key to economic growth.” Really? Then what do they propose we use? Japan doesn’t exactly possess natural resources or cheap labor. The resources are in Arabia and Russia and China, the labor is in China and India, so what should Japan do? It doesn’t look like we’ve got anything to trade on but our knowledge. Nothing but our creativity. In the 80s, America was losing to Japan in terms creativity when it came to cars and home electronics, but in the 90s they made a comeback with IT creativity. What kind of creativity will Japan utilize going forward?